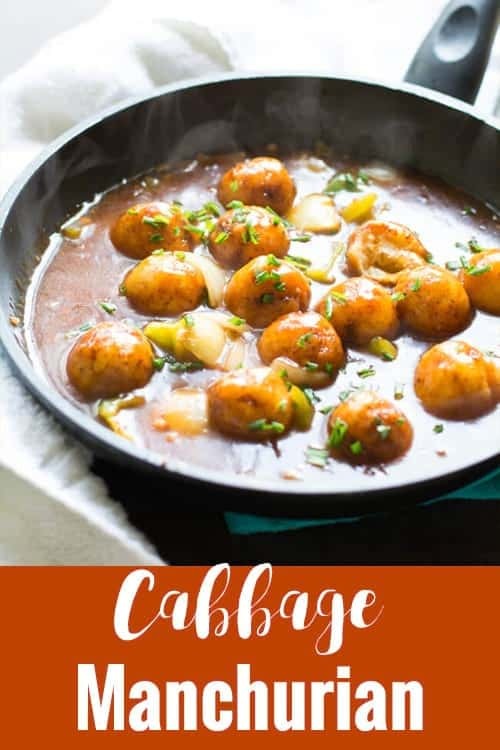 Cabbage Manchurian recipe illustrated with step by step pictures and instructions. Cabbage Manchurian is spicy, sweet, crunchy, soft and this dish does taste everything you hope. And a delectable Chinese side dish that can be made effortlessly. It is interesting to try out various cuisines at home and it is exciting if the recipe is really simple. So I definitely suggest you try this cabbage Manchurian recipe. And I’m sure you are going to love this. 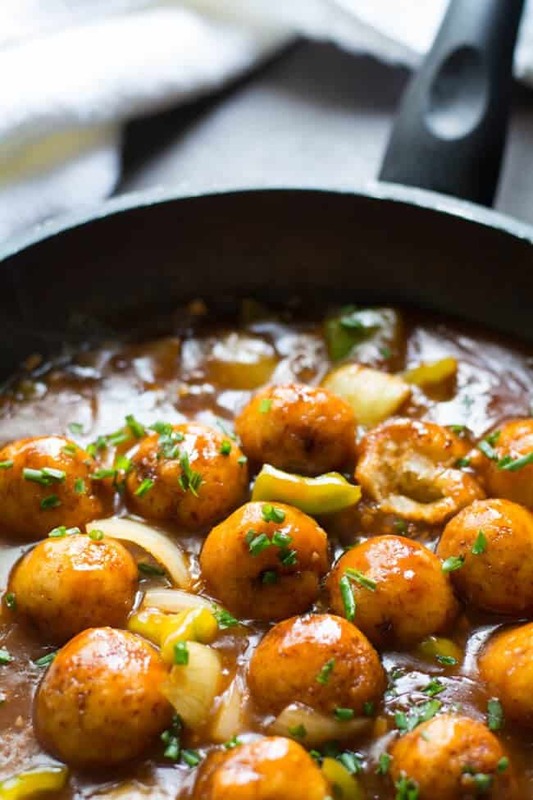 Manchurian is one of the popular Chinese dishes not only in China but around the world. It became famous undoubtedly for its bundle of taste. Which has got everything in it, sweet, salty, spicy, crunchy, crispy? And these taste does compliment each other that everyone loves it. 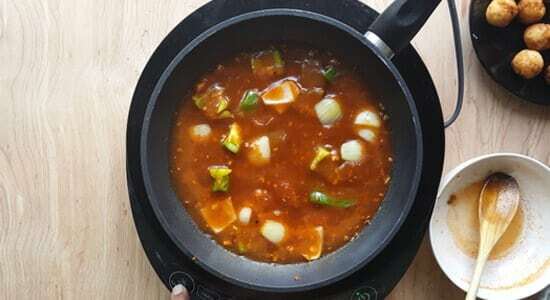 Manchurian can be made with many variations of vegetables/chicken. Chicken and Cauliflower Manchurian are very famous dishes in India. Overall this cabbage Manchurian recipe does taste slightly similar to them but differs greatly in the texture. This vegetarian version of Manchurian is easy to dish for vegetarian and vegan lovers. 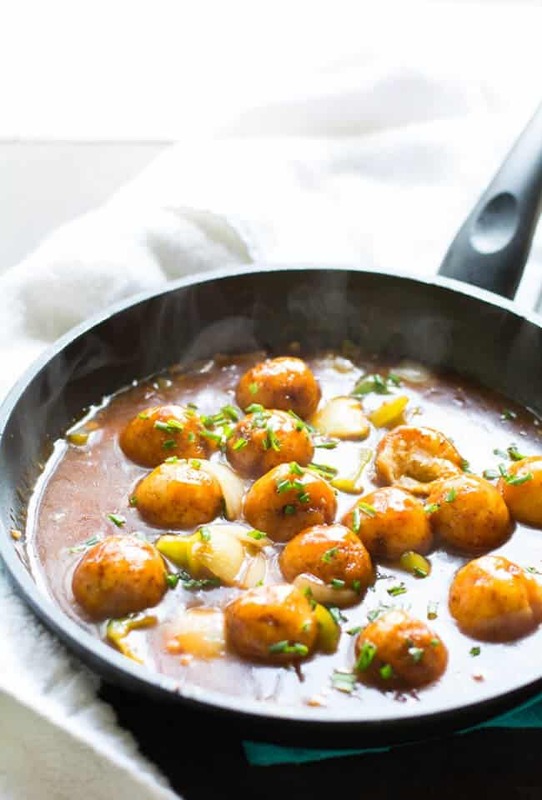 Though the main ingredient changes the other ingredients for the gravy remains the same. 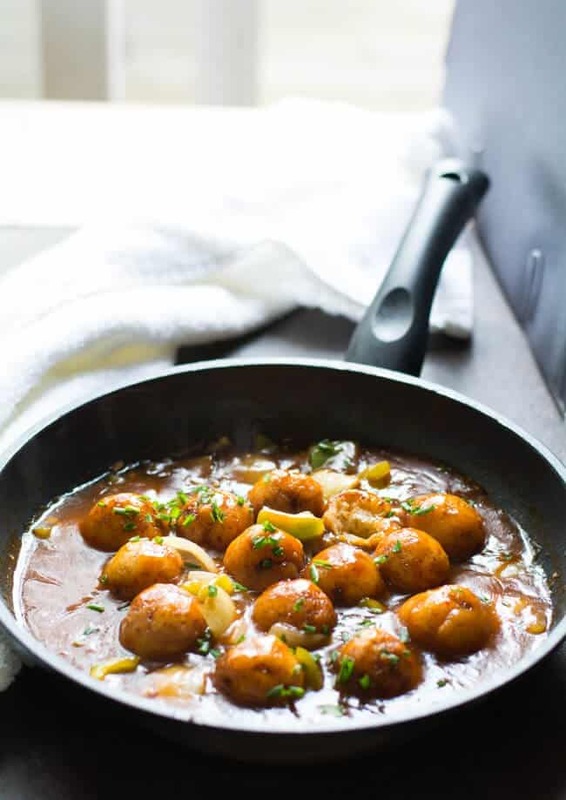 And the veg Cabbage Manchurian Recipe gravy is very simple and needs very few ingredients. And these ingredients may available in your local stores. 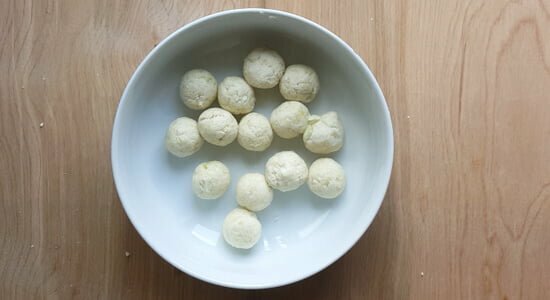 In case you are planning to make cabbage Manchurian recipe for a party, the dry balls can be made in advance. And add these to gravy before serving. Searching for more like this cabbage Manchurian recipe? Squeeze out the juice completely from the cabbage. As not properly squeezed out vegetable may absorb more oil while frying. The squeezed out water extract this vegetable can be used for making vegetable broth. For variation, add grated carrots or other vegetables for making Manchurian balls. 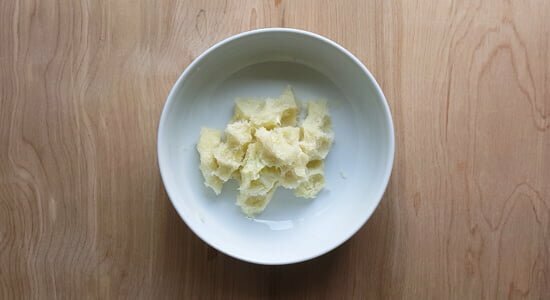 The same recipe can be used to make thick or light consistency. To achieve desired consistency, adjust the water. The cornstarch thickens quickly so proper care should be given. Grate cabbage measures about 2 cups and squeeze them completely to extract its juice. Add all 1/3 cup of all-purpose flour, 1/3 cup of cornstarch and 1/2 Tsp of salt. Combine them well and make small sized balls. 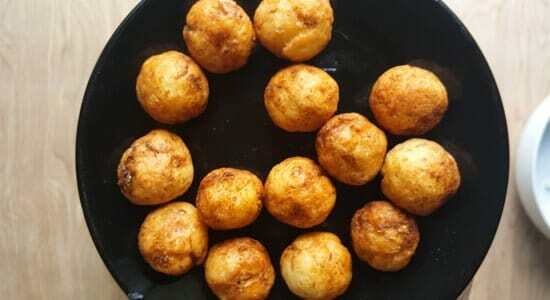 Heat cooking oil in the pan, add these balls one by one. And fry them until it becomes crispy and golden brown.in color. Transfer them to the kitchen towel to remove excess oil. Keep it aside and we need it at the final steps of this dish. In a small mixing bowl, add chili paste, soy sauce, rice vinegar, tomato ketchup, cornstarch and 1 cup of water. Dilute and combine them well. Keep it aside. 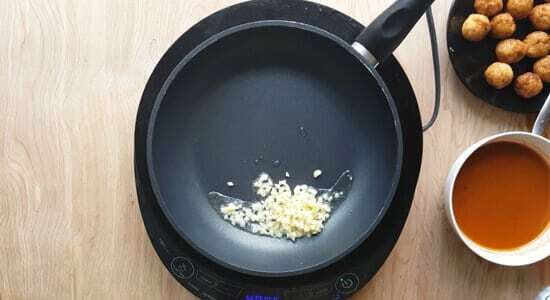 In a pan add a teaspoon of cooking oil followed by minced garlic. Fry them on high flame for few seconds. Add a half cup of cubed green peppers and a half cup of cubed onion slices. Flash fry them for a minute in high flame. Now add the spice mixture we made. now our Chinese gravy is ready. Cook until it reaches desired consistency. Add fried balls just switching off the flame. Combine them well. And serve cabbage Manchurian hot along with rice, flatbread etc. Cabbage Manchurian recipe-learn how to make this Chinese style side with step by step. This gravy dish made with cabbage, soy sauce. Perfect to serve with fried rice or noodles. Grate cabbage and squeeze them completely to extract its juice. In a mixing bowl cabbage, all purpose flour, corn starch, and salt. 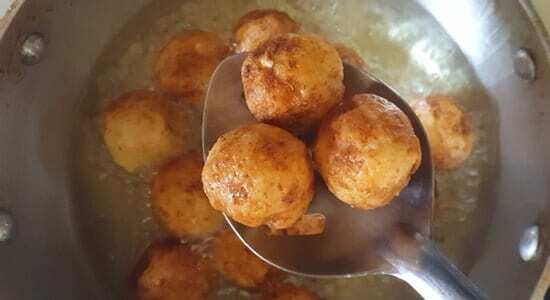 Divide into equal portions and make small sized balls. Heat cooking oil in the pan for frying. Add cabbage balls one at a time. Fry them until it becomes crispy and golden brown in color. Transfer them to the kitchen towel and keep aside. 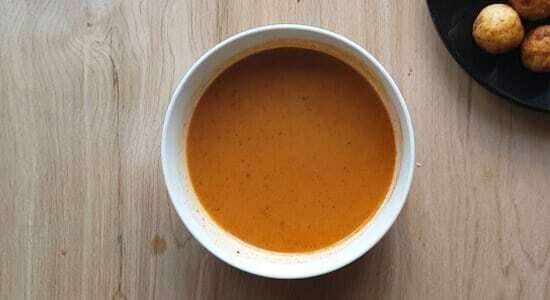 In a small mixing bowl, add chili paste, soy sauce, rice vinegar, tomato ketchup, corn starch and a cup of water. 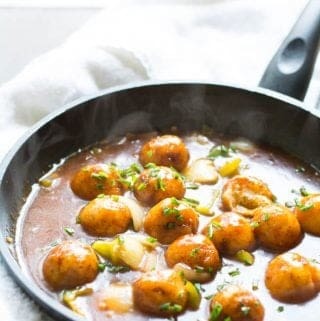 In a pan add a teaspoon of cooking oil and minced garlic. Saute on high flame for few seconds. Add green peppers and onion slices. Saute for a minute. Now add kept aside spice sauce mixture. Cook until it reaches desired consistency. Add fried balls just switching off the flame. Serve cabbage Manchurian hot along with rice, flat bread. How to make cabbage Manchurian crispy? A moisture content of the cabbage-this is one of the factors that determine the crispiness. So, squeeze out its juice as possible as you can. Cornstarch/corn flour-this is another ingredient makes it crispy. Frying in the proper heat-fry in medium heat and stir them occasionally to make it evenly get cooked. Can you freeze Manchurian balls? I would suggest you serve as soon as you made. Though you can freeze the leftover. The freshly made food always tastes good and this rule applies to this recipe as well. Cabbage Manchurian recipe without cornflour? Yes, you may substitute cornflour with arrowroot starch/flour. I know some of you do not prefer onion and garlic. Skip these ingredients from the list while making. But for others, garlic brings out all the flavors and taste of the recipe. Skipping these ingredients may not be advisable. This dish is best to be served with fried rice, naan, noodles, roti, steamed ice, etc. The dry cabbage ball by itself can be served as an appetizer, serve it along with the tomato ketchup or any of your favorite sauce.